I have entered the realm of Alternative Medicine, namely Advanced Allergy Therapeutics, or AAT. I went to my first AAT appointment, not wanting to get my hopes up ( just in case it didn't work), yet at the same time I knew it had been working for others I knew. So, yes, I had hope and was looking forward to answers, getting to the bottom of things and feeling better rather than feeling icky all the time, even while avoiding the (increasing number of) things I was allergic to. The doctor began by listening to my (abbreviated) health history. Then, he began testing pressure points on my body and doing strength testing on each point. Strength testing consists of me putting my right arm straight out in front of me, locking my elbow and making a fist. The doctor then presses down on my arm as I in turn press upward in effort to keep my arm from going down. This strength testing is done while he presses each of the pressure points, as well as when testing for each of the allergens. I had suspected yeast overgrowth and low adrenal function, and tested for those being weak(no surprise there). He later recommended Morinda Supreme Noni powder for that(which I am taking). My liver seemed to be fine, thyroid marginal(I suspect those problems as it's in the family) but ok, digestion was weak(again, no surprise, but I hadn't mentioned this before the testing). I was then hooked up to the computer. This consists of an arm cuff similar to a blood pressure cuff, only it doesn't fill with air, it is about half the size, and it is placed on the forearm just below the elbow. This cuff is how the signal of the allergen is transmitted from the computer to my body. We tested a whole lot of allergens that first day and ended up with a list of main things that needed to be taken care of before I would be able to treat specific single foods. The good thing is, once the main things are treated, that often takes care of many/most of the allergenic foods. AAT has the ability to break foods down into miniscule components, and to treat those components. Often, those foods span over huge food groups. The thing that floored me and made me nearly an instant believer in this process is that I hadn't even TOLD the AAT doc that Salicylates and Glutamates were something I had struggled with. Remember my low-Sal diet I went on before finally going to the conventional allergist, who told me "there's no test for that and no treatment other than avoidance"??? Salicylates were the definite first thing that I needed to have treated. The treatment consists of the AAT doctor sending the signal for the allergen to the arm cuff. I stand and turn around and the doctor uses this vibrating instrument thing(sorry, don't know the real word for it-I'll have to ask!) and runs it down my spine, once while breathing in, once while breathing out, and then once more while breathing in and once more while breathing out. This instrument is said to send signals to the brain and the rest of the body, to encourage a positive response to the allergen, instead of a negative response. Then I sit back down and he does the strength test again to be sure it worked. If I am weak to it, then he breaks it down to the tiny components and we treat those. At that time(barring any questions/discussion), the appointment is finished and I avoid the allergen for 2 hours. After that I should be able to have the allergen without any problems. I can go back anytime after that 2 hours and be treated for something else, of if I decide I'm feeling great and don't want to go in, there's no hurry. It's completely up to the patient. So far, all of my treatments have been successful. I have been treated for Salicylates, Glutamates, Corn, Grains/Wheat, Milk/Dairy, and Plant Phenolics from the main list. Vitamin A was taken care of once I was treated for Salicylates, Protein was taken care of once I was treated for Milk/Dairy, and Soy was taken care of as well. Soy was similar, although it was easier to live soy-free than it was corn-free, since most things with soy were labeled as such. I have also been treated for Molds(when we had flooding and my sinuses were raging and my neck was sore and stiff and I had a slight headache) and the symptoms subsided within the 2 hours after my treatment. I could BREATHE! I could think more clearly! I had Plant Phenolics treated last week, and I was no longer enduring a scratchy throat whenever I drove around in the country(I live in the country-hard to avoid that!). The trees aren't actually blooming/pollinating yet, but they are producing alleles, which are known to cause problems in people with allergens. I had Dust treated today(amazingly, I did not test weak to Dust Mites!). As it is, I am feeling better than I remember feeling for quite some time---I would almost say I feel better than I have my entire life, minus the fact that I am still avoiding many foods. It feels as if a cloud has suddenly lifted and the longed-for sun is shining once again. Making your own kefir is a simple and cheap way of getting your daily dose of probiotics. Many people have been on one or more rounds of antibiotics in their lifetime. Antibiotics, though admittedly beneficial in fighting off infection, have been overused. This overuse has wreaked havoc on many people's immune systems as their natural "good" bacteria have been killed off along with the bad. This would explain why often a yeast infection(whether vaginal, thrush, ringworm, etc.) of some sort is often known to follow a round of antibiotics. For what it's worth, yeast overgrowth usually causes people to crave/consume more carbs and sugars, since this is what the yeast needs to thrive...and this often leads to gaining weight. Taking some form of probiotics will help to repopulate the good bacteria in one's gut. It will in turn strengthen your immune system and probably improve one's digestion. I began making and drinking kefir soon after I made my appointment with the AAT doc. Since I was not able to get a Rx from my allergist for a systemic antifungal, I decide I was going to try this route to get rid of the annoying Yeast Beast. I found Kefir far easier to make than yogurt, and come to find out it offers more diversity of probiotic strains than yogurt, as well as more of them per quantity of milk it takes to make it. Be sure your glass jar is clean. If you use conventional cleansers or antibacterial soap, or bleach, be sure to rinse VERY well, as these can kill your kefir grains. Vinegar works well as a cleanser and disinfectant. 1. Pour your milk into your jar. 2. Plop your kefir grains in. 5. Pour kefir and grains into colander over bowl. Drain, stirring the kefir to work it through the colander and ending up with the only the kefir grains in the colander. Kefir will keep in the fridge indefinitely(months). I have read that once you have strained your kefir, you may leave it on the counter at room temperature for one more day in order to let the bacteria eat the lactose, creating a very low-lactose product. I haven't tried this, so don't know whether it tastes any different. The lower the fat in your milk, the faster the culture will develop and the sooner it will turn into a curd-like texture. The curds are easily broken up though, not as firmly set as cottage cheese. I am needing to separate my kefir grains and pass some on to friends soon, as mine have been multiplying like crazy! When you first start to make Kefir from dormant kefir grains(like, if you get it in the mail and the poor thing froze), it may take a few days for the balance to get back in sync. I had really bubbly kefir for a day or two, but after that it was just right! I have been drinking my Kefir every day now and must say the yeast problems I was having are gone! Yeah for probiotics! Frustrated with Allergy Shots--What Now??? I went on the elimination diet, as my allergist recommended, and stayed on it. Except for accidental exposure/ingestion of my allergens, I didn't cheat. I started the shots as well. I did feel somewhat better, but not great. And when ragweed season(August--read: Allergic Hell month) came, I felt HORRIBLE. No better than if I was just taking Loratadine every day. And I was taking it every day AND getting the shots AND avoiding all of my known allergenic foods and their families...and still felt horrible and could barely function. I had very little success in adding any new foods in. When I asked the allergist or his assistant about what to do, I was told to give the new food a month to be sure I was or wasn't reacting. I suspected my cycles to have something to do with how/when I reacted to things, so the thought was to give it the whole month and see if there was a pattern. Obviously, if I had an obvious immediate reaction, I would quit that food and go back on the elimination diet until I had a week free of reactions, and then attempt to add back a different food. Over the course of the time I was on the elimination diet, I repeatedly tried to add wheat back in. According to my skin testing, I should have been ok with it, but I could tell I was having reactions to it. Not the immediate reaction, but a few months ago I noticed that when I ate something with wheat flour(using flour from the corn-free foods list), I would get the hiccups. After 3 days of having wheat, I developed back pain under the left shoulderblade, heartburn, and then progressed to abdominal pain and other symptoms. I believe I was also becoming more and more sensitive to new things. It was like my body was saying "Hey, my allergens are gone--I need something new to react to--let's react to something else!". I started reacting noticeably to things such as dishwasher detergent, scented dishsoap, people's perfume/aftershave smell, fabric softener smell on other people's clothes, food smells in the air. Exposure to these things would cause me to have instant brain fog, itchy nose, sinus irritation/drainage and headache. If I washed the kids' hair with baby shampoo or used conditioner, or got conventional dishwashing liquid on my hands, they would be raw, cracked and sore for 3 days. I also started to have a stiff neck, jaw pain/clicking, constant drainage down my throat, clogged sinuses. Finally I was able to get a Rx from the allergist(antibiotics-a Z-pack) and started feeling better...but then THAT caused other issues(read: yeast problems) that the allergist only wanted to treat with creams. I suspected systemic yeast problems but could not get a Rx for a systemic antifungal. In an attempt to get control over the yeast, I started making my own kefir and drinking that everyday. In addition to the struggle of adding new foods(and trying to stick to the crazy limited diet) and becoming more sensitive to new things, and the sinus problems, my shots were giving me problems. I've always had problems with my left arm itching after the shots and had mentioned it to the doc. He told the nurses to make sure I had taken my Loratadine, do an epi rinse on the needle before getting the serum ready, then follow the shot with a cream and then ice. Well, I was still itching as the shots increased. Then they reformulated my serums, making them weaker. Still, my left arm was itching for days. Especially if/when I was exposed to something I was allergic to--even something like, say, the smell of a Sharpie marker(which contains corn). All of these problems got worse over the holiday season(and I stuck to my diet the best I knew how, fixing my own dishes for Thanksgiving and Christmas and avoiding the rest of the family's food for the most part). In October, I found a thread in the Avoiding Corn forum about a treatment for allergies called Advanced Allergy Therapeutics, or AAT. Come to find out, there was a AAT doc(Chiro) near me. I wasn't ready to jump in yet (seeing as I have been paying for all this allergy stuff out-of-pocket and I am not monetarily rich), but happened to find someone from another state that was going to the AAT doc near me. I began to follow their journey and correspond via email to get updates as to how things were going for them. They were having excellent success and were able to eat the foods they were allergic to with no problems. They really encouraged me to make an appointment. I asked my conventional allergist what his thoughts were in regards to AAT, and was told "Nothing has been proven with those types of treatments. There are only testimonials, but no scientific evidence. I wouldn't advise throwing too much money in their direction." FINALLY, in January, I made an appointment with the AAT doc for Valentine's Day. I waited for that day, wondering what it would bring. Would the testing show any similarities to the skin prick testing? Would the treatments work? Would I react to the treatments? Could I start to live a normal life again and not constantly be worried about what to eat, what to breathe, what to wash with, for pete's sake??? And would I go broke with this therapy? There is nothing quite like walking out to the chicken house to check on the flock and returning to the house with a farm fresh egg or two in hand, still warm since the chickens just laid them. You can't get any fresher than that! I decided to make some quiche, since I happen to have everything in the house to make it. This has been one of my 'safe' foods on my Allergy-Avoidance diet. Some with corn allergy *may* have problems with the cheese, but I seemed to do fine with it. Your mileage may vary. Microwave the spinach just so it doesn't t have big frozen chunks of spinach when you are mixing it. Then add the eggs, the shredded mozzarella cheese, and however much salt and pepper you want to add. Spray your pan with cooking spray(I use a 'safe' oil in an oil mister). Or use a paper towel or your fingers and spread a bit of oil on it. Pour the mixture in and smooth it out. Bake at 350* for 30-40 minutes, until set. I like to let it bake long enough to brown the top a bit. It will rise up a bit in the oven, but when it cools it will go back down. This is a fairly frugal meal. Being allergic to Corn, Soy and Coconut sure brings one's average American lifestyle to a screeching halt. Adding Peanuts, Tree nuts(specifically pistachios, hazelnuts, pecans, but avoiding all), Peas, Tomatoes, Potatoes(and Peppers and Eggplant by default since they are in the same family), Garlic, Mushroom, Celery and Cauliflower to the list of foods to avoid makes it all the more interesting to find what I *could* eat. It took me about 2 weeks of research to figure out the basic foods that I could eat and not be consuming my allergens or other foods in their families. Along with the Food Families list I was given by my conventional allergist, I found this Botanical Food Family List to be very helpful. Using this botanical list, I sat down and compiled a basic list of what I could eat. A list of "Yes, you can eat these foods!" was far more uplifting than a list of "No, you cannot eat these foods!". Even with my list compiled, I still had to be very careful of corn and soy derivatives, so there were unwritten rules to go with this list as well. I couldn't just give this list to someone and expect to have an allergen-free meal. ~Meats were my basic protein source, since beans were out of the question(being related to soy, peas and peanuts). I looked for basic, simple meats with no additives if at all possible. Grass-fed/Free-range was much preferred but not always available. ~Milk products(note that for some corn-allergic people, the fortifications in milk are most often based in corn oil and cause problems). Most cheeses have corn added at some point, whether the coloring agent in yellow cheeses, the vinegar in cheeses such as mozzarella, the enzymes in some cheeses, or the starch added to pre-shredded varieties or to the wrappers. I generally stuck to white blocks or sticks of cheese, or an imported parmesan and tried to have cheese in moderation(not every day). I made my own yogurt for awhile, and have recently started making kefir and having that every day. ~Butter--NOT the kind with 'natural flavors', the salted is much less likely to contain corn derivatives. Check the list for promising brands. ~Tea-bulk is best, as many tea bags have potential of containing corn. I believe Lipton tea bags are fine. ~Coffee(? )-there is much debate as to whether there are corn derivatives in coffee. It seems to be on an individual basis as to whether it bothers you. I can't do more than one or at most two cups a day without it bothering me. ~Yummy Earth Lollipops and Candy Drops--Contact them for specific details on which flavors are safe. I used the vitamin C ones as a source of vitamin C, since all of the supplements contained citric acid derived from corn. I particularly like the Roadside Root Beer and the Cheeky Lemon. ~Sunflower Seeds-no special flavors, only the salted/unsalted kind. I did ok with Dave's brand. ~Pumpkin Seeds-Dave's brand is what was relatively easy to find. I prefer raw pumpkin seeds mixed with Craisins and some EnjoyLife Chocolate Chips for a snack. So, there you have it. The basic menu I lived off of for about 10 months! Of all my allergies, Corn allergy has been by far the most difficult to avoid. I wish my allergist had given me much more information than he did when he diagnosed me with corn allergy. Beyond the basic food families list I was given by the allergist, I had to find the rest of the information myself. Thank You, God, for the internet! One might think in order to avoid corn, just keep away from cornbread, corn on the cob, cornflakes and popcorn. No problem, right? Oh, wait. Then there's that pesky high fructose corn syrup that is in just about everything (even though "They" say it's ok in moderation, it's rather hard to eat something in moderation when it's in so many foods, isn't it?). Ok, so that complicated things a bit. It made me wonder what else corn was in and I eventually came to find the Corn Allergen List . Take a peek there and you will be amazed at how much corn has infiltrated the American food supply. Since being diagnosed with my food allergies, I am floored by how much we have altered our foods. Walk into a mainstream grocery store and try to find a loaf of bread without any corn derivatives. Try to find some chicken without any corn derivatives. The options are few and far between. There is also a lot of hidden corn in our foods that a Corn Allergic person will quite likely need to avoid. The hardest thing is that producers and manufacturers don't have to declare it on the labeling since corn is not declared a "top 8" allergen. Also, if it is not an ingredient in the recipe (say, if they use corn starch to dust equipment or in the packaging to reduce product sticking ie. for cheese), they do not have to list it on the labeling. ~Most produce has been washed in/sprayed with a citric acid(read: corn) solution in order to maintain freshness. ~Waxes on produce are quite likely to contain corn. ~Meats, even those with "natural flavors" often contain corn and/or are 'washed' in water containing citric acid. ~ Iodized salt contains corn(dextrin or another derivative). ~Some frozen vegetables are coated in corn starch to prevent sticking. Read labels or contact the company and ask. ~ The fortifications in grains such as rice, and in milk are based in corn. ~Bleach contains corn, though at the moment I don't remember how it is involved in the bleach-making process. I do know that conventional dishwasher detergents, most of which contain bleach, would aggravate my allergies and effect my overall health. When I switched to alternative dishwasher detergent, it made a BIG difference in how I felt! ~Craft items--things such as Crayons and Tempera paints contain corn(I figured this one out when my kindergardener brought home his tempera paint artwork. I had great difficulty sleeping for 3 nights, a headache, stiff neck and was walking around in a fog before I made the connection and banished the painting. That night I slept fine and was feeling great by morning!). Some people with corn allergy even react to meat if it was corn-fed, and to eggs if the the chickens were corn-fed(most are fed a mix of corn and soy with other nutrients added). I was spared from that extent of the allergy, as near as I could tell. Corn allergy sufferers need to consider every aspect of their allergy, not simply the food. There is one site that I have gone to nearly every day since I found it after being diagnosed with Corn Allergy. The Avoiding Corn Forum offers support, information, commiseration and encouragement to fellow allergy sufferers(not just corn--many have multiple food allergies like I have). Having that support and knowing you are not alone can make all the difference in the world. We often compare notes to determine which products are safe for corn-allergic people to use. There is also a Corn-Free Foods (& Products) List that has been quite helpful for determining what I *could* eat. If it was on this list, it was likely to be corn-free (always read labels). I just had to then determine whether the items were also free of my other food allergens(no small feat!). There is also blog that is updated ever so often on the latest places to watch out for corn: News For Corn Avoiders . It is helpful for understanding where and how corn is lurking about, and what new places 'they' are finding to use corn. So, there's a glimpse into what a corn-allergic person has to watch out for. I am writing all this in hopes of helping others that find themselves diagnosed with multiple food allergies. In my research and experience, people diagnosed with multiple food allergies are given very little information or resources(unless they are top 8 allergens) and are left to fend for themselves. It is easy to feel alone, overwhelmed and somewhat desperate. The good news is that it doesn't have to stay that way. I have learned a lot, and as I seek health and start feeling better, I want to pass the information on to others that might benefit from it. So, I had suspected Salicylate Sensitivity and gone on a low-sal diet for a time. I felt a little better, but not significantly so. Finally, in the spring of last year, I went in to my family doctor and told her all my sorrows. She promptly referred me to an allergist, where my eyes were opened even further as to just how far-reaching my allergies were. The allergist talked with me for a bit about my symptoms and what I suspected as allergens and what I was doing about it(Claritin wasn't working). I told him that I really suspected Salicylates, and he told me there was no test for that. Then he ordered skin prick testing on both arms. One arm with 74 pricks testing for pollens, molds, and epithelials(dust mites, cat and dog dander, etc) and one arm with 71 pricks testing for foods. For pollens/molds/epithelials, I reacted to all trees except evergreen needled types, about 2/3 of the molds they tested for, cat dander, dog dander, dust mites and guinea pigs. For foods, I reacted to Corn, Soy, Coconut, Peanut, Pecan, Pistachio, Hazelnut, Garlic, Mushroom, Celery, Cauliflower, Tomato and Potato. The severity of the reaction is measured on a scale of 1-4. Soy was a 2 and the rest were between a 3-4++. I was given a list of food families and told to avoid all of my food allergens AND THEIR FAMILIES (as well as the foods not on the list that I knew I reacted to already) for at least 3 weeks. After a week of having no allergic symptoms, I could add one food a week. If I reacted to that food, then I would have to go off of it and not introduce a new food until I had one full week of no allergic reactions. Oh, and if I wanted to treat the pollen allergies, I could sign up and get the immunotherapy shots for 2-5 years. But the understanding there is that it does NOTHING for foods, other than to hope that if the pollen allergies lessen, my immune system might tolerate these foods again. Sounds relatively simple, right? A few rules, but not too bad (Hey, I'm trying to be positive here!). I started the diet, and then, not knowing what else to do(and not wanting my allergies to increase to the point of anaphlaxis, as my allergist suggested might happen), I signed up for the shots. Little did I know the Challenges in store for me. I have had hayfever my entire life, as long as I can remember. It was seasonal, and while living in Colorado it would start when the trees started blooming and end when everything was frosted in the fall. No biggie, really, as long as I remembered to take my antihistamine. In college, I began to notice that my throat/palate would itch when I ate or drank anything peach flavored. Things like Lipton Peach Iced Tea or Peach Snapple or even Peach Jolly Ranchers would 'get me'. And on the rare occasion that I ate a fresh peach, sometimes that would 'get me' too. But not always. Go figure. Randy and I got married and about two years into our marriage we moved to Ohio. For a time, my allergies were actually BETTER, which isn't unheard of when moving to a new location. As expected, my body decided to react to the local pollens a year or two later--and with Ohio's summer seasons being longer, the much higher humidity, and the overall warmer climate, my body had plenty to complain about! Four years into our marriage, Duncan was born and we moved back to CO. Again, my allergies kinda subsided--or else they were just less since we were back in the dry, short-seasoned, less-growing environment. I continued to react to peach things(and even craved them madly, which is an ironic thing with my being allergic to it). I believe I also was reacting to orange juice at this time, but not enough to give it up. Six years into our marriage, we had moved back to Ohio and a few months after that Hunter was born. I was given antibiotics in the hospital which might have something to do with my state of health in the long run... I kind of sank into a depressed state at this time, operating on little sleep and learning how to parent 2 kids in (what was to me) a foreign environment, far away from blood relation. I think it was at this point that I felt my body had started to rebel against me. To betray me. Two years later, eight years into our marriage, Ivy was born. I was able to have a natural birth this time around(yeah!) and felt much more in control of my world. BUT, the August following the June birth was the ABSOLUTE WORST Ragweed Season of my life (followed by the next two Augusts). I was nursing and afraid to take antihistamines on a regular basis lest they reduce my milk supply. It was around this time that I started making correlations to what I was eating and how my body was responding and started to really research what the heck was going on with my body. I was finding out that I was really reacting to a lot more foods than I originally thought, if I paid attention to my body and what I was eating. I had thought maybe it was Oral Allergy Syndrome, a condition where your body mistakes the proteins in certain foods for the proteins of pollens you are allergic to, and reacts accordingly. I was working off of this assumption, until one day I reacted to raw broccoli. It was the only thing I had consumed for a few hours, and the reaction was unmistakable and almost immediate. It was an itchy palate and itchy ears that was just about enough to drive me insane, along with the runny nose and sneezing. After taking a Benadryl, I went back to researching. After not much research, I found a few sites describing Salicylate Sensitivity. And, come to find out, just about ALL of the foods I was reacting to on a regular basis were moderately high to very high in Salicylates! So, for a time I went on a low-salicylate diet. I felt vaguely better, but was still struggling mightily. So, back to the research. ~Redness/irritation at the corners of my mouth leading to cracking, especially after consuming anything in the nightshade family(tomatoes, peppers, etc). It would heal only after I was no longer exposed to the offending food. ~I felt like I was living in a fog the years after dd(my third) was born. Probably for longer than that, now that I think of it. ~I would get tunnel vision type symptoms, could not concentrate for the life of me, difficulty multitasking, very extreme irritability/depression, overwhelmed by/oversensitive to places like Walmart with all the smells and colors and once you get up to the front to check out the beeping would nearly drive me insane. ~Fatigue, lack of energy and stamina. I believe that covers it for now. More tomorrow! There is hope! Thought I would introduce you to part of the crew on our homestead, as well as some of our garden plots. I was out in the herb garden two Wednesdays ago checking out the status of my plants. At that point the chives weren't even coming up. I sighed, bummed that it wasn't Spring YET and started tearing out the old growth and what did I find---Radicchio that had overwintered from my lettuce mix last year! Spring really is here! I also found a few praying mantis egg sacs that I will leave for this year's natural bug-control. I will NOT bring them into the house. Please see Randy's blog for what happened last year! And here is Sweet Pea out in the old shed taking his sunbath(can you see him?). Both kitties are pretty much banished to outside our living area due to my allergies. I've kept them around though, and rest assured they are fed and cared for and earn their keep on the farm catching varmints! While I am at it, here is our veggie garden plot. It has yet to be tilled, as our soil is way too wet still. That box is a sort of raised bed that Randy built last year for potatoes. I think I am going to try sweet potatoes in it this year. To the right and behind the plot is our chicken house and chicken yard. We let them out this time of year, but (try to) keep them within the confines of the fence when our garden is producing, or else we sacrifice a lot of plants and produce! And here are our current chickens. We thought we had 3 hens and a rooster, but yet again we have more roosters than we need. The roosters are Americaunas, the brown and black is a suspected mix of Americauna and ? (We think she is laying brown eggs instead of the green/blue Americauna eggs, but not sure yet. She is supposed to be Americauna), and the black and white speckled one is a Silver Wyandotte. Last time we had a bunch of Americaunas, we had a rooster that developed months sooner than the other rooster. They hatched at the same time. 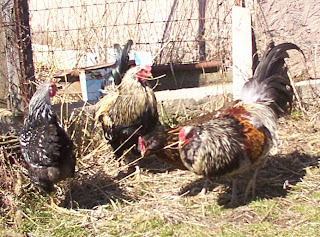 We were sure we had just one rooster....until the other one started growing spurs and eventually crowing. It makes me wonder whether there is some hormone control or something in the species to allow for a dominant male without all the fighting or something. I will have to research that sometime. I figure I should start off my blog with a proper introduction. I am a stay-at-home wife and mother of 3 kids. I am originally from Colorado, but have been transplanted to Northwest Ohio where my husband's family resides. We are currently living in the old homestead(est. a bit before 1900, I believe) on part of the acreage his grandpa grew up in and have been attempting to live the simple life here--no easy task! We have been playing with organic/natural gardening the last 6 or so years, as well as simple animal husbandry(specifically chickens). I have created an herb garden as well that continues year to year. Since the birth of our third child, my allergies that once presented themselves as mere hayfever decided to move over into the realm of foods and it got to the point that every time I ate I had some sort of reaction. I plan on sharing that journey here as well. As the oldest of five children raised on a single income, I was raised by a very frugal stay-at-home mother and hard-working dad. I am quite thankful for that in the current economic times and am always looking for ways to save money. I will share what I do in that regard as well. Follower of Christ, Wife of 1, Mother of 3 Seeking to better understand the Word of God, apply it to my daily life, and live out the grace, love, and mercy of Christ to those around me, that God might be glorified. 1. I need to let my readers know that I do make a small amount from the ads and links on my blog. 2. At the same time, I also want my readers to know that in my blog posts, I only recommend products and books that I would recommend to a good friend. Please read around the link to see what I think of said product and my experience with it. 3. I am not a doctor. What I share is my own personal experience, what I have found in my own reading and research, and my opinions about the above, which may or may not apply to you. If in doubt for your own health, please seek the advice of a physician. 4. I don't have complete control of every ad that shows up on my blog on the side bar or up at the top. If you see one that is offensive, please let me know and I will do what I can to block it. Thanks! Cluster Map-See Who's Been Here!